Blog to End the Occupation: New Video Shows Sacramento Food Co-op Members Singing to Support Boycott of Israeli Products! 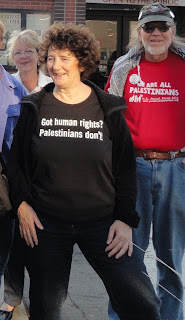 New Video Shows Sacramento Food Co-op Members Singing to Support Boycott of Israeli Products! Members of the Sacramento Natural Foods Co-op sing in support of their efforts to restore democracy at the Co-op and advocate for the human rights of the Palestinian people. Click here for recent updates on the Sacramento Food Co-op campaign to boycott Israeli goods. Over 50 members of the Sacramento Natural Foods Co-op serenaded Co-op shoppers on the public sidewalk next to the Co-op on Friday afternoon, June 3, with back-up guitar, base, and tambourines. In spite of creative actions by coop members (and thus partial owners), the Sacramento Food Co-op Board continues to thwart efforts towards socially-responsible product selection. Click here for updates on the Sacramento Food Co-op campaign to boycott Israeli goods.